The all-new Stelvio has already made a name for itself as a driver’s SUV…and at a price that’s far more attainable than you’d think with a starting MSRP of about $43,000. So when shopping Alfa’s first sport-utility, you might wonder why one model costs almost twice that much? …and I’m Nicolette Viscusi and this is the Stelvio Quadrifoglio. There are a number of these crazy-fast SUVs on the market right now and I’ve driven most of them. Like this Stelvio, the vast majority are based upon car – not truck architectures – and benefit from modern chassis tuning techniques to deliver a taller 5-door vehicle that’s truly track ready. Better yet, contemporary engineering prowess allows you to have your cake and eat it too with 500+ horsepower engines that still deliver 23mpg highway. And the Italians are suddenly all in. Besides this souped-up Alfa; Masearti, Lamborghini and soon Ferrari will all have at least one high performance SUV in their stables. 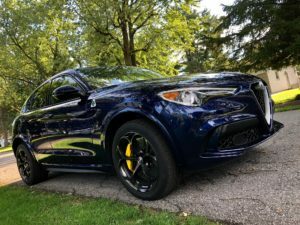 Priced from around $80,000, this Stelvio gets a Ferrari heart transplant; a screaming 2.9-liter twin-turbo V6 capable of 505 horsepower – the same motor in the Giulia that I drove last year so I can attest to its uniquely Italian personality. Marked with a 4-leaf clover, the Stelvio Quadrifoglio is billed as the world’s fastest SUV, claiming the title after lapping the famed Nurburgring racetrack in record time. With extremely direct steering and a paddle shifted 8-speed automatic transmission, this Stelvio reaches 60mph in only 3.6 seconds with a top speed of 176mph. And the Alfa DNA selector – short for Dynamic, Natural and Advanced Efficiency, adds a Race Mode to further tune the adaptive suspension for pinpoint control. Torque vectoring, 20” wheels, 6-piston Brembo front brakes, and a lightweight carbon fiber driveshaft aid in keeping the Quadrifoglio glued to the road. The Q4 all-wheel drive system can transfer up to 60% of the engine’s torque to the front axle and when you’re dealing with 443 pound-feet of torque in a lightweight body, that added traction is certainly welcome. This Stelvio turns into a curve with exceptional sharpness and the adjustable suspension can be set for extreme firmness. As an everyday driver, the Quadrifoglio’s ride is sufficiently supple when set to its natural setting, but even then impact harshness can be jarring so take extra caution to avoid those potholes. But when driven for fun, the sport seats with their adjustable lateral support are a perfect match for keeping you firmly in place, allowing you to comfortably explore the engine’s eagerness with the huge column-mounted paddle shifters. And those shifts are fast and accompanied by gunshot-like firing sounds with each tick. The exhaust music is so mischievous and yet unobtrusive when simply cruising. Just like the Giuia, this Stelvio feels vivacious, light and shockingly agile…you’re just sitting up higher. Concerning turbo lag…there’s a touch of that and then it’s hang on time because you’re going for a ride! Compared with the GLC 63 I recently tested, the Stelvio is far more rudimentary. The cabin is sparse and comes nowhere close to matching the Alfa’s big price tag. It’s short on luxury goodies and feels a little small in the back. And I also wish it had more of a distinguishing appearance. But from the driver’s seat, it is unbeatable. Classified as a midsize, the Stelvio seems a little more compact yet displays a nicely cut cargo area that can gobble up more than you’d expect. And I have no problem fitting in the rear seats even without adjustability. There are a couple of USB ports back here but no separate climate controls or any other kind of luxury car accoutrements to speak of. And with an as-tested price of $94,935 that’s part of the problem. Look around here and you’ll ask yourself, where’s all the stuff? The infotainment system is OK with Apple CarPlay and Android Auto compatibility as is the Harman Kardon premium audio system but for this price, I want more than just OK. The carbon ceramic brakes are really grabby in around the town driving and add $8,000 to the cost. So unless you’ve got racetrack aspirations I’d leave them off. They also make up the majority of the nearly $11,000 in options on this test car which checks in at nearly $95,000.